LAS VEGAS (Mar. 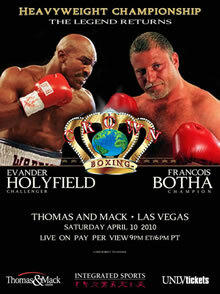 18, 2010) – Four-time world heavyweight champion Evander “The Real Deal” Holyfield plans to make a strong statement April 10 when challenges World Boxing Federation heavyweight title-holder Frans “The White Buffalo” Botha in the 12-round main event, headlining “The Legend Returns” pay-per-view event at the Thomas & Mack Center in Las Vegas. “The Legend Returns,” presented by Crown Boxing, is being distributed in the United States and Canada by Integrated Sports Media for live viewing at 9 PM/ET – 6 PM/PT on both cable and satellite pay-per-view via iN Demand, DIRECTV, DISH Network, Avail-TVN, Viewer’s Choice and Bell TV, for a suggested retail price of only $29.95. The 47-year-old Holyfield (42-10-2, 27 KOs) is coming off of a controversial 12-round majority decision loss December 20, 2008 in Switzerland to then World Boxing Association champion Nicolai Valuev that most observers felt Holyfield really won. All four of Botha’s (47-4-3, 28 KOs) losses have all been to world champions — Mike Tyson, Michael Moorer, Lennox Lewis and Wladimir Klitschko – and three came in world championship fights. Tickets, priced at $25.00, $75.00, $150.00 and $250.00, are available to purchase at www.UNLVtickets.com or by calling 702.739.3267.